Matthews Pierce & Lloyd, Inc. is an established, experienced firm that enjoys a distinguished reputation as among the most capable in the industry. Results are the yardstick we use to measure success. 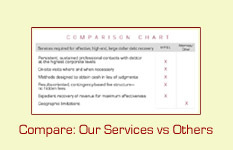 We are an atypical debt recovery service. Rather than follow the herd, we have developed our own special blend of tried and tested, highly effective practices. Our recovery rate is exceptionally high, as is our client retention rate. We employ only diligent, skilled, high-caliber professionals. They are well trained in our own unique, proven methods of responsible, effective commercial debt recovery. Learn More . . .
Our interests match yours. We are paid only when you are paid. Our recovery methods employ careful, highly effective, validated strategies designed to give you the option of retaining overdue debtors as future customers. Diligence and discretion are the keys to these proven techniques. Matthews Pierce & Lloyd can re-structure a new and reliable accounts receivable management program for you, and can manage your needs effectively and in a timely manner, from beginning to end. The Curve of Gratitude demonstrates that by taking the first step today, you will increase your company's cash flow, maximize recoveries, and add to you bottom line. Let us demonstrate how effective our team can be for you. Learn more. . .